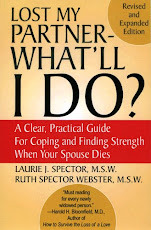 In the initial weeks following your spouse/partner’s death, you may find yourself swamped by well-meaning family, friends and others anxious to show their caring and support. Phone calls, e-mails and visits can provide a welcome cushion from the shock and pain of your loss. There may be times however, when all the attention becomes overwhelming. Keep in mind that others tend to feel helpless when a death occurs. The calls, visits and invitations help them feel less so. You might suggest they help with small chores such as marketing or helping sort paperwork. Your comfort level, however, is what’s most important, however, so help others to really “be there” for you by gently setting some limits. Look for tips on how to set limits with others in our next post.